Cockroaches thrive in the ideal environments of homes and restaurants. With an abundance of food, water, warmth and nesting areas, they can remain active throughout the year. These resilient pests can carry harmful bacteria and diseases into the areas they infest. If left untreated, a Cockroach population can grow from a handful to over a million in one year. 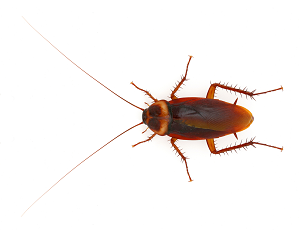 Our inspectors are trained to identify cockroach infestations lurking around your home. Once an infestation is identified and the structure examined, your inspector will design a custom treatment plan to get rid of them. Treatments for cockroach infestations, include extensive baiting and spraying cracks and crevices. Getting rid of Cockroach infestations is a process that demands expertise and patience. While a significant number of Cockroaches are eliminated within the first few months, it can take up to a year to completely eliminate a large infestation. Regular perimeter sprays and interior baiting will ensure total elimination of the Cockroaches in your home and will keep them out, guaranteed! If these steps are followed, we guarantee your home will be Cockroach free. If they find a way back into your home on our watch, we’ll get rid of them!